It is cold, windy, wet and miserable at the moment and there is nothing quite like a warming healthy meal to drive away these colds and sniffles. Soup is what we need, but it is not always practical to carry around with you, So here is an alternative solution, which is a variation on an old classic flavour combination! This recipe provides you with antioxidant beta carotenes, antiseptic properties from the garlic and coriander, antiinflammatory omega 3 from linseeds, other essential fatty acids and minerals from the sesame. Ginger is warming and a good anti-inflammatory, it also aids digestion and absorption of some of the plant nutrients. 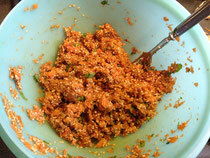 Tamari and Mirin provide a nice flavor without the need for salt. Mirin is made from fermented rice, it is sweet in taste and useful as a sweetener substitute in cooking. 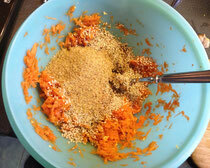 Puree the carrots, sesame seeds, linseeds, garlic, add coriander and tamari and mirin to taste. 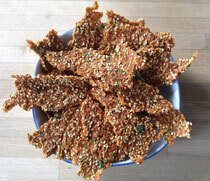 Spread thinly on baking paper and dehydrate in dehydrator or overnight in a low oven (about 50degrees Celsius). Cut into slices and take with you for a tasty healthy snack on the go..